The Solar Physical Vapor Deposition (SPVD) is an original process to prepare nanopowders. This method has been developed in Odeillo-Font Romeu in France using solar reactors working under concentrated sunlight in 2kW solar furnaces. Various oxides, pure or containing other elements in addition, have been obtained. 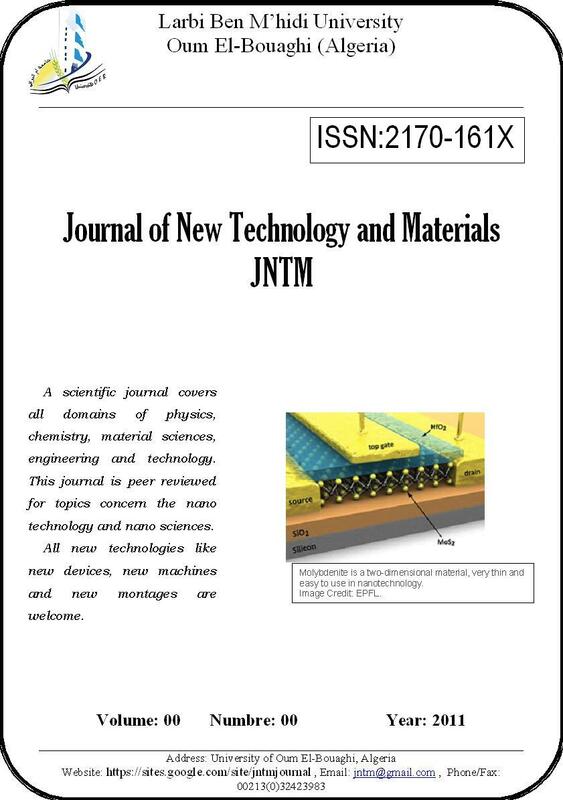 This paper focus on ZnO and TiO2. based oxides It is shown that the X-Rays Diffraction analysis allows a fine nanostructural characterisation of the nanophases present in these nanopowders. In many cases, HRTEM or SEM and XPS complement the XRD analysis. The properties such as Electrical, magnetic properties, photoreactivity, luminescence … known on microstructured materials of the same composition are revisited on these nanopowders or on nanomaterials prepared from them and led in many cases to original behaviours. Bazer-Bachi B., Blanc D., Kaminski A. , Lemiti M., Nouiri A., Sayad Y.
response LBIC when this technique is combined with spectral reflectivity to allow determination of cells quantum efficiency. and to check passivation efficiency of fabricated cells. Aklouche H., Bedrici-Fraï N., Gatignol Ph., Potel C., Rahmi F.
Abdelmalek N. , Aida M. S., Attaf N., Bougdira J., Hadjeris L., Herissi L. , Moualkia H.
temperature varied between 10-5 and 102 (Ω.cm)-1. Aida M.S., Attaf N., Bougdira J. , Daranfed W., Fassi R., Hadjeris L. , Hafdallah A., Rinnert H. , Ynineb F.
spectra. Broad emissions at around 1.27 eV was observed in the photoluminescence spectrum measured at 77 K.
Abdelmalek N., Attaf N. , Hadjeris L. , Herissi L., Moualkia H.
analysis showed that the prepared films have an hexagonal structure with (002) reflection. The transmittance data analysis showed a high transmission coefficient in visible range (85%) and an optical band gap lying between 2 and 2.4 eV. Scanning electron microscopy (SEM) and electrical measurements showed a pronounced effect of the solution temperature on thickness, dark conductivity and photoconductivity to dark conductivity ratio (σphot/σdark) parameters. The evolution of such parameters as a function of temperature are presented and discussed. It was found that the (σphot/σdark) ratio reaches high values of the order of 104 and 105 at 55 and 65 °C, respectively. These results indicate that CdS thin films prepared at these temperatures are convenient for optoelectronic and photovoltaic applications. Aida M. S., Beggah Y. , Bouchekhlal A.
the nonlinear coefficient of this system was nearly constant in the range of sintering temperature. The highest breakdown voltage was 1143.4 v / cm for the varistor sintered at 1350 °C the sample C sintered exhibited the best electrical properties. Azizi C. , Hamma I. , Saidi Y. , Zaabat M.
A Tow dimensional numerical model of channel potential for GaAs MESFET (Metal semiconductor field effect transistor)doped uniformly .the model takes into acount the effects in channel region considering both the photoconductive effect and photovoltaic effect at the gate schottky . the 2-D potential distribution function in the active layer of the divice is solved numerically under dark and illumination condition. Benhizia K. , Boudine A. , Kallaa L.
time and the distance. And we have also established the relationship of the drain current in a 2D channel of a transistor called « spin-FET » where it was matter to highlight this type of transport. This study was crowned with a numerical study of the characteristics of spinFET 2D transistor depending on the external field and internal characteristics of the semiconductor.